While I am not sure whether or not the citizens of the galaxy far, far away celebrate the St. Valentine’s Day, it isn’t like they don’t have love in their world. It is a very fascinating thing when you think about it, every fictional world that we have created over the years has love. It is fundamental to everything that we do; it is important in every second of our lives. For all of the Star Wars fans out there, in today’s article, we will talk about the most romantic Star Wars couples that we know of. In the beginning, the girl felt a real dislike for him, but, as we know, this feeling of disgust eventually became something quite different. He seems annoying to her, but at the same time, he attracts her, which she finds very weird in herself. Constant squabbles and even a kiss with Luke weren’t able to drown out this incomprehensible feeling, because the princess, although while rejecting it at all costs, has fallen in love, which makes her even angrier. It seems like this entire story of their love is paradoxical, it is about people coming from hating each other to passionate and mutual love. 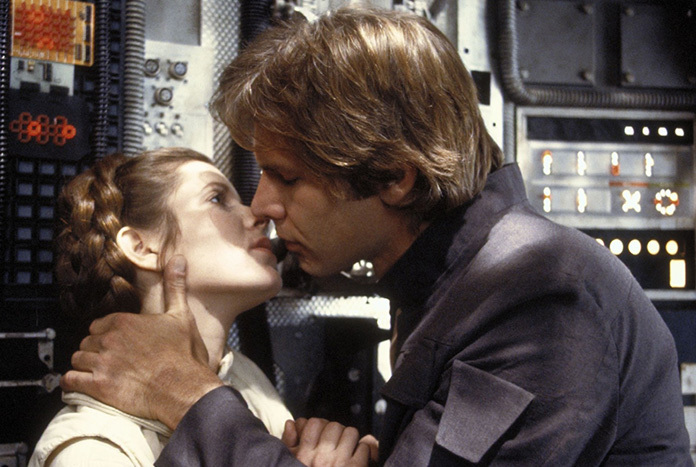 Leia used sarcasm and sheer anger in response to the constant hints of Han that she had feelings for him. And while we don’t know that much about Han’s feelings in this, we can safely assume that these hints were his way of showing his brewing love for her. As a result, they both realize that they have fallen in love with each other. Now, in spite of his character, behavior, and deeds of Han, she is ready to do anything for him. He, in my opinion, proved his love for Leia, by deciding not to interfere with her and Luke’s relationship, thinking that the princess loves Skywalker. So, Han showed that the happiness of his beloved for him is the most important thing in the world. The opposites are usually attracted to each other, but in the case of Han and Leia, it seems that strong characters came together, which made their relationship so complicated. Obviously, their life together will be filled with disagreements, struggle because neither Princess Leia nor Han Solo is used to making compromises. Even Leia’s declaration of love was not typical because of Solo’s response. “I love you.” “I know.” These phrases fully explain the whole essence of their relationship. The example of Leia and Han shows that love can arise from anything. As a result of fighting and not recognizing their feelings, the princess found her love in a cheeky smuggler, who probably didn’t think about loving the obstinate and stubborn girl. Their relationship was wild, intriguing, passionate, and entertaining to watch after as viewers. If you want to experience these feelings in your own life, then be sure to visit this Russian dating site, where you will be able to meet someone online. Here’s a couple that you may not have heard of. And we don’t blame you; these characters are a part of the Star Wars extended universe, which, in this case, includes Star Wars Galaxies, The New Jedi Order, Dark Nest, Legacy of the Force, Fate of the Jedi and X-Wing series. Nevertheless, there is something to talk about. Just as in the relationship between Han and Leia, everything was rough from the start, they weren’t able to see eye to eye. It was all because of the grudges that they’ve held for each other’s families and people in general. But, as it turned out, there was nothing more than politics to it, they were able to handle their differences. Later on, they started to enjoy each other’s company. It won’t serve it justice to call it a slow burn, but they eventually came to love each other. If you thought that Han’s and Leia’s love for each other was an unlikely thing to happen, then we should remind you about this odd couple. There seems to be a pattern, no relationship in Star Wars seems to be going towards love from the very beginning, it is more about mutual development, gaining each other’s trust and understanding. The same goes for Luke and Mara. At first, Mara was the emperor’s right hand, and she was sent out with the mission to assassinate Luke Skywalker. Yet she was unsuccessful in her mission; they came to discover that they are very much alike and that they feel a sense of love for each other.